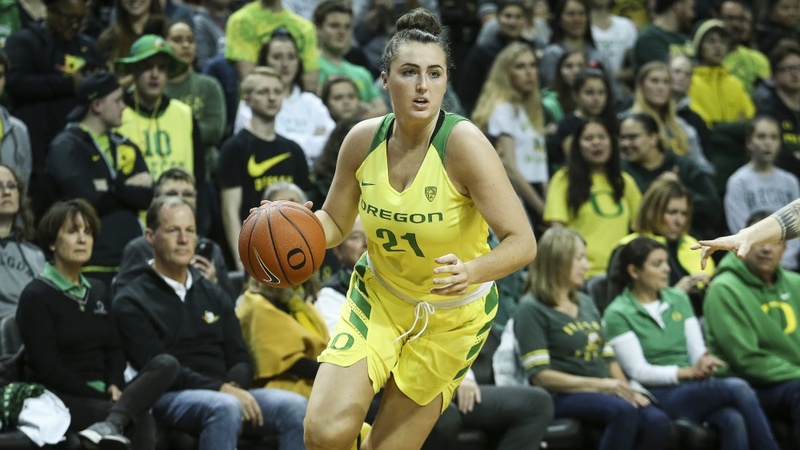 Playing for the UO’s powerhouse women’s basketball team is not all three-pointers, fast breaks and NCAA Tournament bids. There’s also the whole school thing. As with other student-athletes on campus, the Oregon women face a demanding schedule. The Ducks are in the home stretch of a season that began in November and included 33 games and 11 road trips, including five days in Las Vegas for the Pac-12 Tournament. If they continue their winning ways, the Ducks (29-4) will play up to six more games in the NCAA Tournament over the next three weeks. On the basketball side, demands on the athletes include daily practices, weight-lifting sessions, physical therapy and of course, games, home and away. On the academic side, there’s classes, labs, homework and exams. The competing demands require the student-athletes to be smart about how they use their time, she said. Boley finds studying is easier to do after practice and after games because she can focus her attention on her studies. “Especially with traveling, with road trips, I really have to plan ahead, figuring out what I can do on the road, what I can bring with me and work on while on the plane or in the hotel room,” she said. The hard work has paid off for the sharp-shooting forward. She’s excelled on the court, where she averages 13 points a game and led the Pac-12 in three-point shooting — sinking 95 treys for a 45.7 shooting percentage — and in the classroom, where she maintains a 3.66 GPA, earning her a spot on the conference’s all-academic second team. Boley, a Kentucky native who transferred to Oregon from Notre Dame after her freshman year, is majoring in product design and minoring in architecture. She said she’s particularly interested in spatial design, an emerging discipline that examines how people move through interior and exterior spaces. She wants to work as a designer after college. Even with the planning, studying on road trips can be a challenge, Boley said. And the demands of basketball ease up in the offseason, leaving more time for a social life and a heavier academic load. Coach Kelly Graves said creating a team culture that values academics begins with the recruiting process. This year’s team was under a lot of pressure because expectations for them to excel were so high, he said. Sophomore Satou Sabally, an All-Pac 12 player, said staying on top of her studies means sacrificing in other areas, like a social life, at least during the season. Sabally owns a 3.5 GPA and, along with fellow Ducks Lydia Giomi and Ruthy Hebard, earned honorable mention recognition on the Pac-12 All-Academic team. She’s studying international studies but may change her major. She’s thinking of attending law school and has a particular interest in social work and helping people in need, such as the Syrian refugees who have landed in her native Germany. It’s not easy balancing academic and athletic demands, she said. “It’s just one mental thing and one physical thing and both require rest, focus and concentration,” she said. “You are not able to give 100 percent to both things. You really have to balance it out. Missing class time and exams on road trips means it’s critical to establish good communication with professors, she said. Jennifer Jackson is the academic adviser for women’s basketball, as well as for acrobatics and tumbling, soccer, and about one-third of the football team. She played basketball at Kansas and understands the rigors facing student-athletes. She said she helps the women schedule their classes, tracks their progress toward their degrees and schedules tutors if needed. While on the road, the women study on the plane and during downtime in their hotel rooms. They make sure to go to professors’ office hours while on campus. And they get over to study at the Jaqua Academic Center for Student Athletes whenever they can, she said. “What’s interesting is, a lot of the athletes will say the structure helps them get things done,” she said. The Jaqua Center is a great resource, especially for women’s basketball, since it’s just across the street from Matthew Knight Arena, where they practice and play, she said.